Applause is our traditional form of expressing enjoyment, appreciation, and approval. It is heard - and expected - at theaters, sports events, award ceremonies, and when good news is shared. It may even be asked for when welcoming someone - "Let's hear it for . . ." or "Give him a hand!" 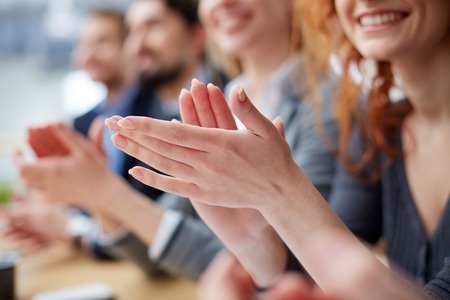 Whether you are applauding someone's accomplishment at work, a speaker giving a talk, or attending a performance event of any kind, showing appreciation by clapping is a part of the social expressions that bind us together. Performers and their audiences need each other. There is a reciprocal relationship. Many speakers, politicians, and actors receive applause when they enter the stage. They are being welcomed, and shown appreciation for their known works. An audience applauds at the conclusion of a speech, performance, event or ceremony as a sign they enjoyed what just took place. This sometimes becomes a standing ovation if the performance or celebration is extraordinary. But the audience decides, in the present moment, whether or not to bestow this honor. Clapping during a speech, performance, or ceremony is situational. For instance, classical music performances require silence until the very end. But when attending an opera, it is fine to show appreciation for a specific piece or performance when the music breaks. Many speakers will break at the end of a sentence or sub-topic for the audience to clap. But to clap or create excessive noise while the speaker is making a point is considered rude. And who hasn't put hands together and cheered when a baseball player is rounding the bases on his way to home plate? But the noise level is much more subdued when he is up to bat so that he has an opportunity to concentrate on when to swing. 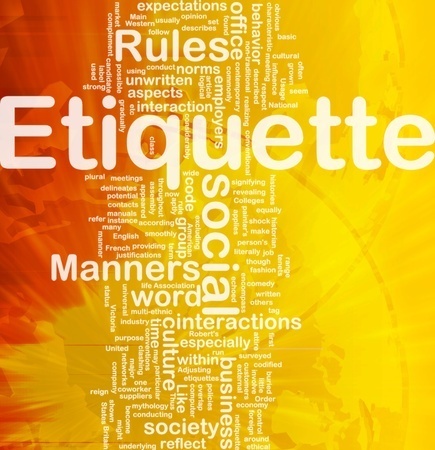 However, if you attend a golf event, remember that silence is golden. Only very light clapping - the golf clap - is allowed once the swing is completed and the ball has hit the ground and rolled to its stopping place. When traveling abroad, or when attending an occasion that is new to you, research before going so that you're familiar with the protocol of applause. If you're ever in doubt about applauding at a particular moment, it's okay to follow what others are doing. But pay close attention! You don't want to find yourself participating in heckling or protesting that you disagree with. 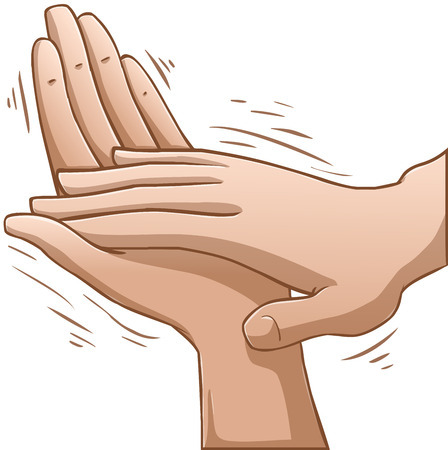 While clapping hands comes naturally to nearly everyone, there is a method to get the best "bang" for your applause. Hold your non-dominant hand at chest level, palm facing inward at a 45 degree angle, and slightly cupped. Move your dominant hand to strike your other hand in the palm with four fingers as illustrated here. This method produces a hearty, genuine sound of applause without requiring much force. So if you're attending a golf game, remember, light clapping only! The decision whether or not to applaud not only depends on the protocol of the event, but on whether you, as the audience member feel you've been entertained or have any sentiment for what you've heard and/or seen. Of course, applause is the demonstrated part of what the audience is supposed to do. However, if you disagree with what took place, or you hated the performance, it's fine to withhold your applause. Just know that this gesture will indicate displeasure. Every performer, player, musician, dancer, contestant, and speaker wants to hear some appreciation from their audience. Think about how you will feel if it's you on the stage someday, and applaud accordingly.